This is my first blog post for 2014 and what better way to celebrate than thanking a friend for their friendship. I am so blessed to have beautiful friends and sometimes with the craziness of life we can forget to thank them for being there. Thank you to ALL my family, friends, blog followers, supporters and people in my life who make it so special. 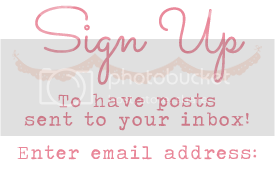 What is a blog hop? 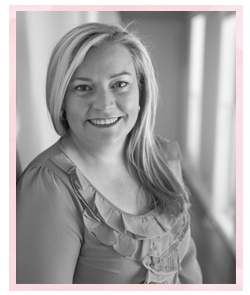 A blog hop is where a group of 'bloggers' post a topic and share links to other blogs and you the reader/follower move from one blog after another seeing all the entries. You should have just 'hopped' here from Kim Badelt. If this is your first stop you can hop all the way around from here or start at the Just Add Ink page. 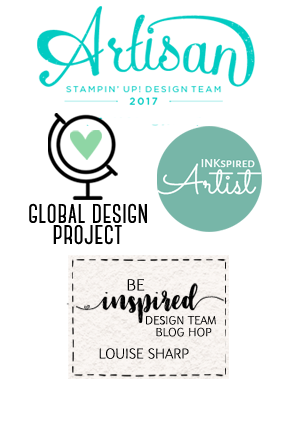 The inspiration for our blog hop is to make something using either the new Stampin' Up! Envelope Punch Board or the new Thinlits Card Dies. I chose the new Thinlits Card Dies using the circle card die. 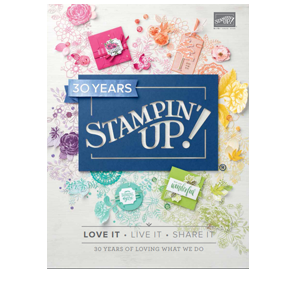 If you are a follower of my blog you will know I used the stamp set 'Kind & Cozy' from page 82 in my last Just Add Ink challenge! Yes, I am loving this little flower stamp, it's too adorable. 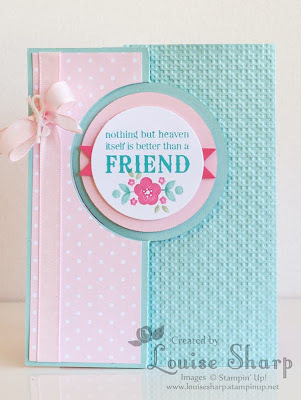 Your next stop or 'hop' is the ultra talented Mae Collins and I am sure you will love her beautiful creations using both the Thinlits and the Envelope Punch Board! I LOVE, LOVE, LOVE your color choices! Just beautiful! Louise this card is so softy and girly - just beautiful! Lovely card Louise - the colours are very delicate. Lovely soft colour way,with a little texture. This is a lovely card Louise I love the colour choices. 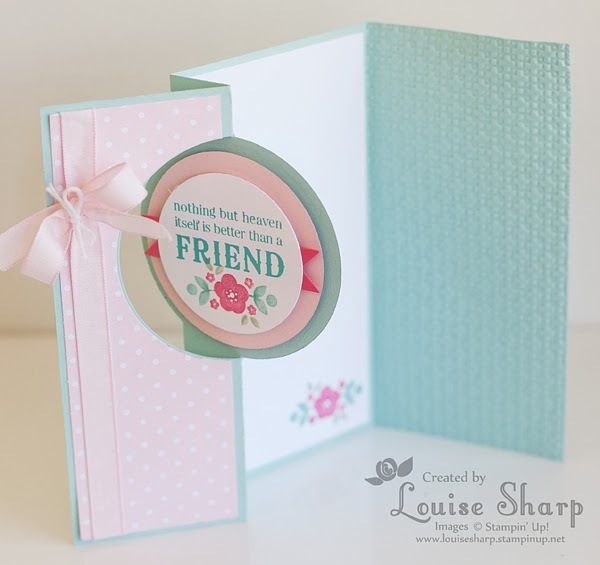 This is so pretty and feminine Louise, I love the soft colours. A really lovely card. Simply divine, Lou - I love it to bits!! Oh this is so pretty Louise! 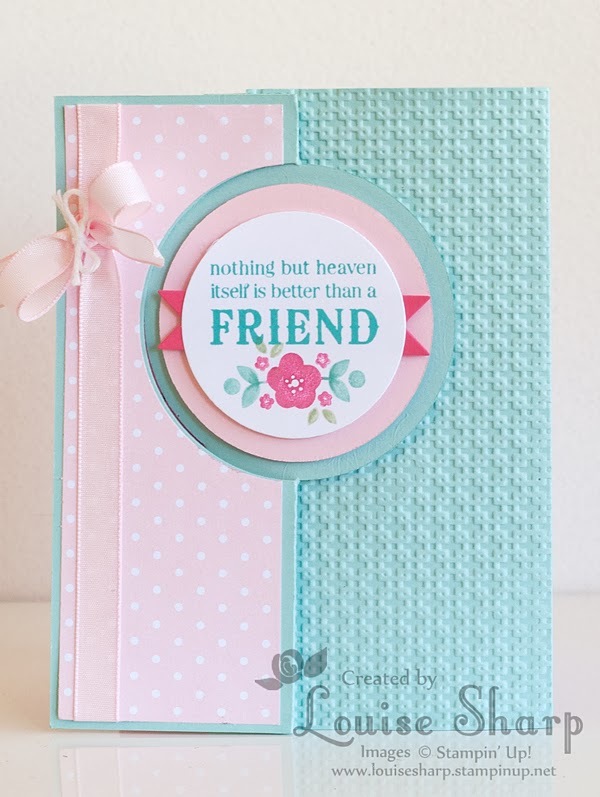 I love the soft colour combo and the pretty image you've used! I adore your soft, feminine colours Louise. Great card.